Check out our updated article on the best office plants here! Everyone who works in an office knows how important office plants are to the atmosphere of a workplace. Even a single small tree in the corner of an office can do wonders for productivity. Researchers such as Dr. Roger S. Ulrich of Texas A&M University, Helen Russell of Surrey University, and Dr. Virginia Lohr of Washington State University found that the presence of live plants reduces human stress. The busy background noise of an active office distracts office workers and increases stress levels. But because live plants absorb sound, they promote a quieter atmosphere. 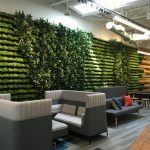 That’s why placing lush plants in strategic locations around an office, such as between cubicles, acts so effectively as natural sound barriers. But the benefits of office plants go far beyond reducing stress and noise levels. Offices with an abundance of plants improve employee health by significantly reducing the levels of airborne bacteria. In fact, statistics show that employees who work in offices that do not have many plants use more sick days than employees who work in offices that do. Office plants also play an important role in relieving dust and mold allergies. Their leaves and soil naturally collect the dust and mould particles that would otherwise float freely through the air. Employees who suffer from allergies at work can also suffer from a weakened immune system and lower productivity. The water evaporating from the leaves of office plants creates a humidity level that office workers find very comfortable. Without plants, office air is not humid enough. Low humidity levels damage expensive materials such as wood. Some plants provide more benefits than others, and maintenance levels vary widely between species. Small potted plants have all the benefits of large plants, but on a smaller scale. If an office contains a large number of small plants, the benefits will be just as obvious as if the office had one or two large plants instead. Because the typical low light conditions and dry office air do not have a significant impact on the overall health of peace lilies, these efficient natural air purifiers remain one of the most popular office plants. A peace lily with blooming white bulbs is truly a sight to behold, especially when several peace lilies of varying sizes decorate different parts of the office. Peace lilies do require some nurturing to thrive, but they are still considered a low-maintenance plant. If a plant that interacts with its environment is preferable, an ideal choice for the office is the popular heartleaf philodendron. Heartleaf philodendrons remain small when frequently cut back, so most offices place them on desks and other surfaces with limited space. Larger areas are usually reserved for plants that require more room. Similar plants include devil’s ivy and English ivy. To give these active office plants room to grow, suspend them in a hanging basket or place them on ledges. The office cactus plant can be a great plant for individual desks keeping a small robust plant around your personal desk space is a good start to enriching your office space and purifying their air and others might also buy their own little plants and you could start the new office trend in greenery. Cactus plants are known for their hardy nature and require little watering, but they will need to be near sunlight – yet not in direct sunlight. Another great plant for the office is a bamboo plant. Once potted correctly with satisfactory drainage, pebble based pots will grow really well. If you have a larger communal space, these are perfect. Place them near indirect sunlight and away from air conditioners and heating sources. They thrive on filtered water as the chlorine in regular tap water can damage them. They should also be trimmed regularly as they tend to get top heavy. These are also considered lucky plants. Offices that suffer from dry, uncomfortable air often choose to invest in Areca palms. Considered the most efficient natural air humidifier available, Areca palms keep offices pleasantly humidified and work hard to remove airborne toxins. Some offices even use Areca palms instead of conventional electric humidifiers. Offices that have room to spare frequently invest in small potted trees. Most office trees stay small enough to thrive comfortably in areas with limited space. While trees generally cost more than smaller office plants, no office plant outperforms trees when it comes to keeping temperatures comfortable and cutting back on pollution. The ficus variety is the most popular type of office tree. Ficus trees lose their leaves as a warning sign of stress. While this is sometimes messy, it is a clear sign that it needs maintenance. You might even consider a small fruit tree for a bit of fun. In spite of their differences, all office plants cut back on energy usage and contribute to the overall health of an office space. 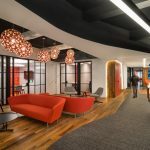 Next articleWill MIMIC be the Office of the Future? Great tips for office plants. Thank you! We’re going to try the peace lilies in our financial office—they sound wonderful. Some of our customers mix our silk flower arrangements in with their “reals” to give a more lush atmosphere without the added care. Love this post. I have over 20 years of landscape gardening behind me, so i know when im reading something good when its to do with plants and the garden. I really like the look of the bamboo plant that you posted! It’s such a great piece of decor, and it really makes the office space feel more sophisticated. Plus, it sounds like they can do really well in offices since they don’t need direct sunlight. That makes it a lot easier to keep them alive! Thanks for sharing great tips and idea for indoor office plants such a plant reducing the workload on air conditioning units. I like how you say that office plants relieve dust and mold allergies. It would make sense to find something that is going to help with this if your employees have allergies. Before you get the plants it would also be a good idea to poll your office and see what plants each employee would prefer. I am surprised when you mentioned that Dr. Ulrich, Russell, and Dr. Lohr all agreed that having live plants in one’s office reduces stress in human employees. If I were to have plants in the office, I would make sure to hire a professional to keep them maintained. Not only will it help keep employee spirits high but also be able to teach employees about environmental awareness.